Blue Jasmine; Finally A New Woody Allen film Worth Seeing. Cate Blanchett in “Blue Jasmine”. After making a handful of genial comedies in the early 70s, Woody Allen shot Annie Hall in 1976. Which was supposed to have centred around the comedic figure of Allen. But when test audiences responded so warmly to the romantic chemistry between he and Diane Keaton, they scheduled significant re-shoots and the whole film was re-edited as a romantic comedy. Diane Keaton and Woody Allen in “Annie Hall”. And for the next 20 years, Allen made a succession of intelligent, personal, warm and occasionally poignant personal dramas, the vast majority of which were romantic comedies, with the emphasis, as it always should be, on the Romance. These were interspersed with the occasional pure drama, centred around a series of female protagonists. Films like Zelig (’83) The Purple Rose Of Cairo (’85), Hannah and Her Sisters (’96) and Bullets Over Broadway (’94), and then September (’87), Another Woman (’88) and Alice (’90). Nearly all of them were wonderful. Manhattan (’79) was a masterpiece. And Crimes and Misdemeanors (‘89) a minor one. 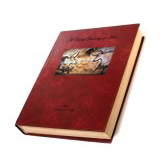 But from Mighty Aphrodite in 1995 on, his muse deserted him. Sure there was Sweet And Lowdown in 1999. And Vicky Cristina Barcelona is lovely to look at. But for the last 20 years or so, we’ve all been waiting in the vain hope that it might, just might belatedly return. Or that at the very least, he might slow down and think a bit more clearly and carefully before embarking so pointlessly on his next film. Incredibly, and to pretty much everyone’s complete surprise, he’s done exactly that. Blue Jasmine isn’t just the best thing he’s done in 20 years, a barbed compliment if ever there were one. This could comfortably sit with any of those films he was making in the mid 1980s. It’s an occasionally rye but mostly poignant portrait of a society woman, Cate Blanchett, who has fallen spectacularly from grace. We move back and forth between the present, and the events that led to her fall in the past, as she tries to pick herself back up off the floor and start all over again. Blanchett and Baldwin in Blue Jasmine. Whilst not an actual adaptation of A Streetcar Named Desire, the film shadows Tennessee William’s iconic play almost scene by scene. And yet curiously, far from detract from the film, this merely serves to further add a sense of doom and foreboding. All of the cast are foot perfect. Blanchett, obviously. But Alec Baldwin too, as the Bernie Madoff type that she was married to, Sally Hawkins as her sister and Bobby Cannavale as the latter’s latest beau. Very unusually, this is a film that actually delivers on all the hype it’s been generating. 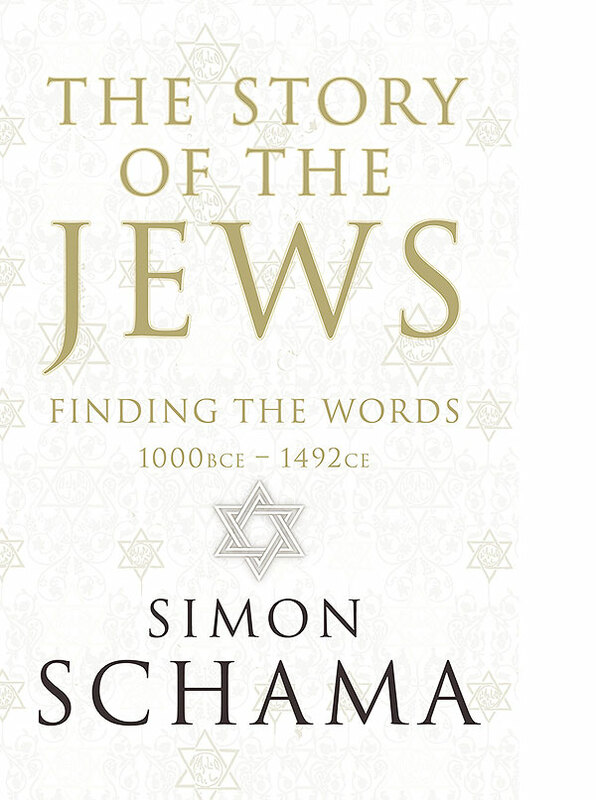 Simon Schama’s The Story Of The Jews on BBC2. 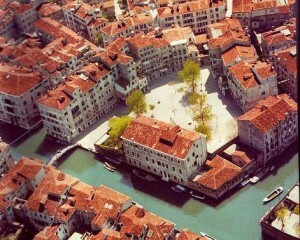 The Jewish Ghetto in Venice. Simon Schama’s appropriately erudite The Story of the Jews continues on BBC2. One time Art Critic for the New Yorker and currently a professor at Columbia, Schama signed a much publicized book and TV deal with the BBC worth £3m in 2003. Simon Schama’s Power Of Art duly followed in 2006. There, he took eight heavyweight artists ranging from Caravaggio and Bernini to Turner and Rothko, and somehow managed to find fresh and revealing insights into each and every one of them. Which is no mean feat when dealing with the likes of Van Gogh and Picasso. This latest five part series is every bit as engaging, and manages to be sufficiently personal to genuinely move without ever dwelling for too long on inevitable pathos. The first episode covered the first millennium BC, whilst the second took us up to the catastrophic expulsion of the Jews from Spain and Portugal in 1492 and ’97. It was this that led to the creation of the first ghetto in Venice, which marks a decidedly ambivalent juncture. It was wonderful to be finally given a home. And yet, they were clearly marked out as Other. 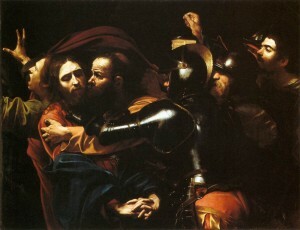 Caravaggio’s “The Taking Of Christ”. It’s a vast subject of course, but it would have been interesting to have a bit more on the crucial period between the 2nd and 6th centuries AD. Christians and Jews had come increasingly to understand themselves in opposition to one another, and there were then as many Jews preaching hatred against Christians as there were Christians spewing vitriol against the Jews. Incredibly though, no sooner had this mutual and profound mistrust become ingrained, one of the two sides suddenly “won”. As in the 4th century A.D., and almost overnight, the whole of the Roman Empire converted to Christianity. Not only that, but over the next few centuries, the rest of north and eastern Europe quickly followed. 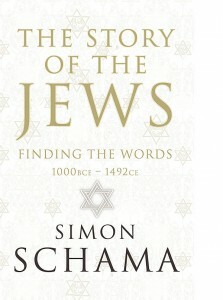 Simon Schama’s “The Story Of The Jews”. So, it’s been suggested, that anti-Jewish element that was so central to the early Christian Church came to be codified as part and parcel of Medieval Christendom, based as it was on the Roman Empire and its Latin language. When then the Islamic Empire sprang up in the East soon after, it was all too natural for the West to lump the Jews together with their new foe. This doesn’t of course excuse the unspeakable treatment of Jews by Christians in the Crusades that followed from the 11th century on. And indeed throughout the rest of history. But it does suggest an explanation as to why it is the West has always been so much more intolerant of Jews compared to the Islamic world where, at the very least, they were allowed to exist. But that’s a minor quibble. This is a comprehensive story brilliantly told with a mixture of scholarship and, unsurprisingly, feeling. The Story Of The Jews continues on BBC2. The Genuinely Enigmatic film “Upstream Color”. Shane Carruth and Amy Seinmetz in “Upstream Color”. 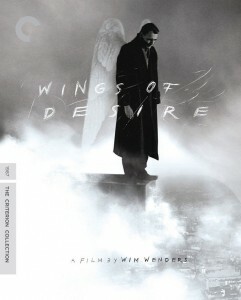 When talking about his 1987 film Wings Of Desire, Wim Wenders said there are two types of films. Those that say this is what I am, be it a thriller, a love story, or a romantic comedy. And then there are those that ask you, what am I? Few films fit quite so comfortably into that second category as Shane Carruth’s latest feature, Upstream Color. This is the follow up to his 2004 debut Primer, which was interesting, but very much a first film calling-card. This is a significantly more substantial affair. So what is it? Amy Steinmetz in Upstream Color. Well, it’s clearly some class of a love story. But the two leads, played by Carruth himself and the impressive Amy Seinmetz seem to inhabit some sort of a contemporary dystopia, where nefarious individuals are harvesting mutant maggots. Against which though, there seems to be some sort of benign individual shadowing the victims to administer a cure, in much the same way that the angels glide through the aforementioned Wings Of Desire offering succour. Bruno Ganz in Wenders’ “Wings Of Desire”. But Carruth is clearly at least as interested in visual and sonic juxtapositions and the connections and moods they produce, as he is in narrative coherence or intellectual clarity. Remarkably, and very unusually, this doesn’t detract– at least as yet – from the experience of watching his films. But the loudest cinematic echoes evoke David Cronenberg (whose under-rated Cosmopolis I review earlier here). If Cronenberg had taken acid and had somehow managed to make an entire feature film that night, this is what it would look and feel like. Cold, unquestionably, at times creepy, and at others somewhat anaemic. But constantly interesting and endlessly fascinating. This is that rare thing, a genuinely enigmatic film. And Carrruth is one of the very few serious film makers working today. See the trailer to Upstream Color here. 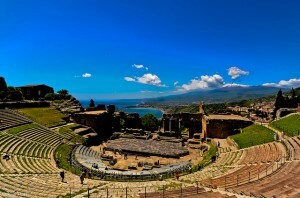 BBC4 Programme on the History of Theatre and Ancient Greece. Michael Scott’s latest programme on Ancient Greece is a fascinating exploration of the twinned birth of democracy and the theatre in late 6th and early 5th century B.C. Greece. Don’t be put off by its title though. The Greatest Show on Earth is, happily, significantly better than that would suggest. In the first of the three episodes, he explains how the birth of theatre came about for exactly the same reasons that the Athenians triumphed so unexpectedly at the battle of Marathon in 490. 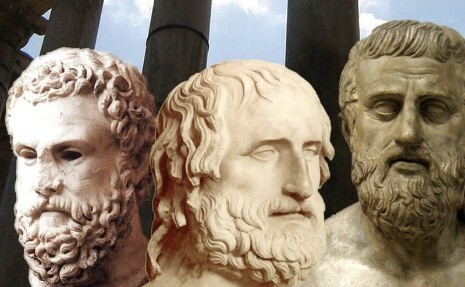 Because the democratic reforms in the Athenian constitution in the previous decades gave each of its citizens a sense of pride, of ownership and eventually entitlement. Crucially though the theatres that they now began building – having invented architecture as well – fulfilled two functions. It was where the conflict between the ethics of power and personal morality could be explored by tragedy’s great triumvirate, Aeschylus, Sophocles and Euripides. But it was also, literally, the arena in which democracy physically took place. It was in these theatres that their political debates were staged. The second episode then looked at the 4th century, after Athens had fallen, laid low by its disastrous expedition to Sicily. 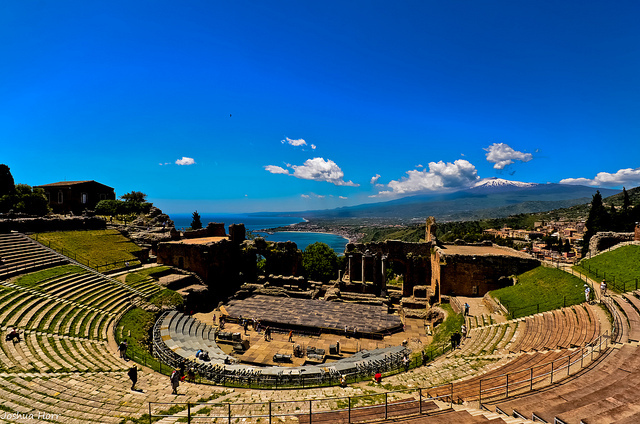 It explored the way in which theatre then came to be exported by Alexander with the spread of Hellenism, as Greek culture came to conquer the world. And how paradoxically, at least as far as its relationship to Athens was concerned, its theatre became ever so slightly impoverished. In that it ceased to address the concerns of Athens, and became instead a universal medium. 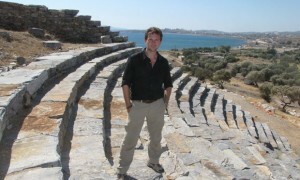 This is another of Scott’s superb programmes on Greece, after this summer’s Who Were The Greeks. And he managed to assemble a particularly impressive group of academics to help explore the topics raised. Notably Paul Cartledge, who is one of the movers behind the excellent series of webinars under the Reading Odyssey umbrella, here. And Robin Osborne, whose Greece in the Making 1200-479 is, quite rightly, the first book that any Classics’ student is pointed in the direction of. Try not be put off by that incredibly irritating title though. The Greatest Show on Earth isn’t quite as annoying as the one he gave a previous programme on Alexander, the execrable Ancients Behaving Badly. Hopefully he’ll reign in his tendency to saddle his programmes with twee attempts at riding the popular Zeitgeist. 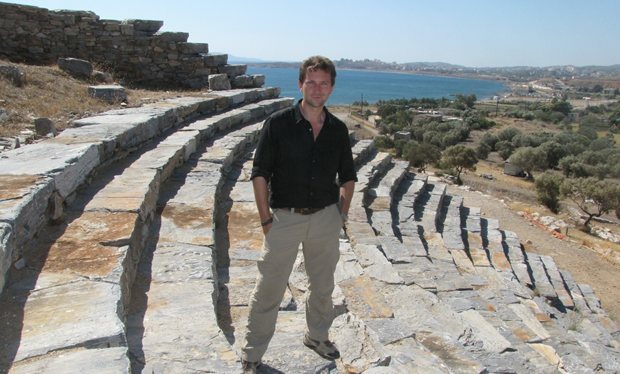 Because titles aside, he’s fast establishing himself as the BBC’s most engaging and informative voice on Ancient Greece. Episode 3 is on Tuesday next. And you can visit his website here.